I can count my best friends on one hand. I’ve been present at all of their marriages. One in an historic town house turned Inn (where I got a glimpse of what a wedding can be among friends), one in the islands (where I learned what “jet-set” really means and that true friends are those with whom you can travel), and one here in Richmond, in the mid-morning, which is by far the most elegant I’ve witnessed. Here’s why you should consider a morning coat and a morning wedding. It was at the end of January. A blizzard threatened. Miraculously, the weather broke for the ceremony and it was sunny and warm. We, the groom’s men were in traditional kit (the first time in innumerable weddings that I’ve worn a cutaway.) The groom, as a gift to us, had selected the B-Squared ties that we were to wear with our morning suits: grey with a woven ecru dot. He wore a woven, sky blue number with a neat dark blue geometric; I bought one myself and will wear it the day of their anniversary. The bride wore the same wedding dress as her mother and older sister had before her. The choir was in fine voice and the groom still plays the recording each anniversary. My mother-in-law, a layperson, was the crucifer. These, then, are the elements of a classic morning wedding. 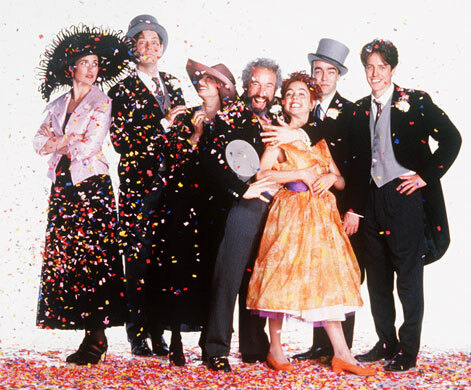 Having been married once in the late afternoon and once at night, I can highly recommend the morning wedding. There is less time spent twiddling your thumbs waiting for the big event. Besides, the men get to wear morning suits and how often do you get to do that? I really like the individuality that allowing your groomsmen to choose their own ties brings to a very formal event. It injects a bit of festivity to the proceedings. And the best weddings are always fun. After the sun dappled ceremony, we all repaired to The Jefferson where we were treated to a seated Champagne brunch. Really the most civilised of meals. The newlyweds stayed the evening and we met them the next day for luncheon in the middle of a blizzard right before they left for London. It was, in retrospect, one of the most stylish weddings I’ve ever been privileged to attend. Happy Anniversary Mr. and Mrs. W.! 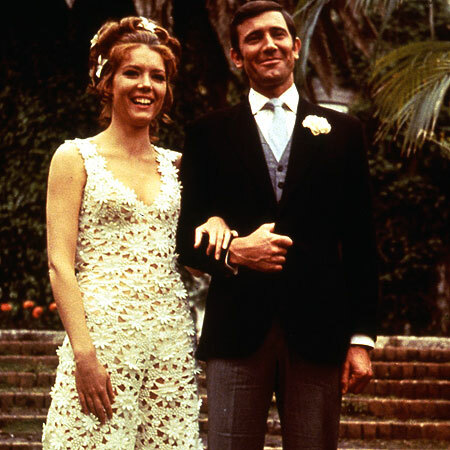 This entry was posted in Elegantology and tagged "Four Weddings and a Funeral", Diana Rigg, George Lazenby, James Bond, On Her Majesty's Secret Service, The Jefferson Hotel, Tracy Bond, wedding plans. Bookmark the permalink. Ah! Mr. B and I were married at 12:30 on the most amazing October day. And he and his friends wore morning suits. I’ve wished a couple of times since then that they had just worn blue blazers; this eases my mind. Nice photo of Lazenby, but he is not wearing a morning coat in that photo, is he? Hello J. Gumby and welcome. No, he is not. But it was a morning wedding. That rig is called a stroller, I believe. I’ll have to have a closer look at the trousers to be sure. Mrs. B., What luck! Morning suits are not to be missed. There have been so many other opportunities for him to wear his blazer. I’m sure he and his friends were very dashing. I still don’t understand the rubes who wear black tie for daytime weddings. Couldn’t possibly look more rental or cheesey, or just wrong. There is nothing more handsome than a daytime wedding with the men appropriately attired in morning coats. And speaking of winter weddings, did you see the wedding dress Lady Pamela Mountbatten wore when she married David Hicks? It was decorated with white mink. There are photographs of it in the book that their son recently published. Stunning. I agree with Reggie re. black tie during the daytime–yet it happens all the time! We (that is my husband and me, not me and Reggie) were married at 11 a.m., in a chapel with an at-home reception in early August. By some miracle, the weather cooperated. Good thing, because we did not have a back-up plan. I attended the wedding of a family friend, also a morning wedding, in a beautiful church on a dark, rainy Spring day–everything was in technicolor, thanks to God. Mimosas were passed as we arrived at the country club reception, followed by a sit-down salmon luncheon and then dancing. It was great because the guests did not drink too much (nor did the wedding party). The behavior sure changes at a day time ceremony. It was charming and sooooo elegant! And yes, the gentlemen wore morning suits! Reggie, haven’t seen the book yet. May be a while as I’m working on a few ideas here! Sounds like a beautiful dress and photo. Funny second time this week a Mountbatten has cropped up. The Ws appreciate your kind words. It was a magical morning and, ten years later, it is all still magical. I was married in a Stroller and that is a Stroller George is wearing. I have a Henry Poole Morning coat cut by Simon Cundey along with three Favourbrook waistcoats. I’ll probably never wear any of it again. But I can’t let it go. I wish somebody would invite me to Ascot. Tintin, very elegant. Sir Fopping Flutter, are you out there listening? Lovely post and dramatically introduced with one of my personal favorites, “On Her Majesty’s Secret Service.” It is unfortunate that Lazerby was universally dismissed as the least favored of the Bonds, reducing, I think, unfairly, this movie’s cinematic wherewithal. Diana Rigg was breathtaking and the sound track is one of the finest ever recorded. (Louis Armstrong). As to weddings, I’ve participated in enough to know that there is infinite wisdom in conducting the proceedings early in the day, and I am in total agreement, on the sensibly prudent and most civilized of gatherings — the Champagne brunch. In my estimation, it renders both the affair and the invited guests to a most becoming standard. And a resounding yes on the morning coat – one of the finest cuts of cloth ever deigned for men. Friends once invited a hundred or so to his club for cocktails; during – the couple roamed among their guests announcing their secretly carried out wedding earlier in the day. For me, this epitomized good style. And the wedding party was quite effortless fun for them – I could tell. Forgive my snitty mood, old girl, but how ever could one opine regarding the propriety of gentlemen’s formalwear, yet not know the difference between nominative and objective case pronouns? My husband and me? Me and Reggie? Oh dear me!! Dear Mr. Buckman, welcome and thank you for commenting. I approved your comment because we all need a refresher now and again, and you did it without malice, albeit with a bit of sarcasm. I hope you’ll do the same for me (as nicely as you can) as I happily comma-splice and otherwise murder my mother tongue. Constructive criticism is always welcome, ain’t it? EA, somehow it doesn’t surprise me in the least that you find “OHMSS” and Dame Rigg one of the best. It’s very elegant and amusing. When we meet, we’ll make sure to include a Champagne brunch. It seems fitting.